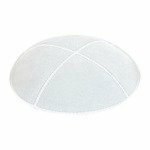 Genuine suede kippot. Ideal for Bar Mitzvah, Bat Mitzvah, and Weddings. Imprinting done directly on the suede.